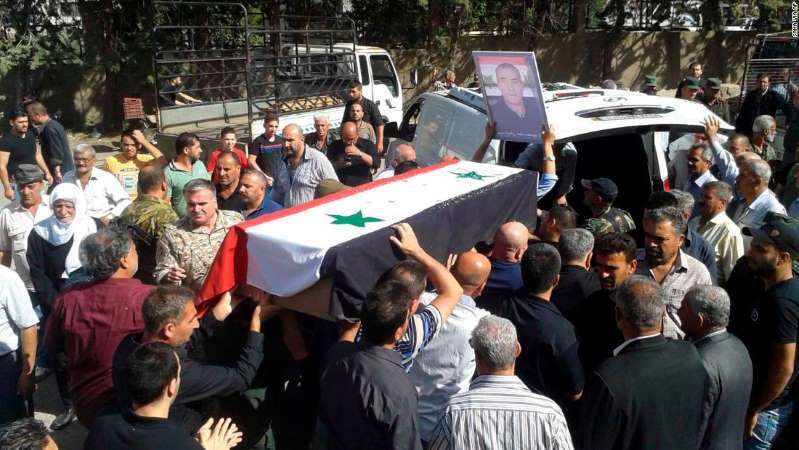 The militants went from home to home, killing families as they slept, before launching several suicide bombings on Wednesday, targeting a bustling vegetable market as well as government-held positions in the southern Syrian province of Suwayda. When the attackers ran out of ammunition, they detonated their explosive vests. By the day's end more than 200 people were dead, and 180 wounded, in a gruesome massacre claimed by ISIS. The coordinated assault -- one of the group's deadliest attacks in Syria for years -- is a chilling reminder that ISIS is far from dead, just a few months after US President Donald Trump suggested the terrorists would soon be gone from Syria for good. [post_ads]"What happened in the past 48 hours tells us a great deal about the new strategy of the remnants of ISIS. Going from home to home stabbing civilians ... the aim is to inflict as much damage as it is to terrorize," Fawaz Gerges, author of ISIS: A History and professor of international relations at the London School of Economics and Political Science, told CNN. "Even though it has been military defeated on the battlefield, lost its physical caliphate, it still has a few thousand combatants spread worldwide who can carry out spectacular, bloody attacks," he added. ISIS lost most of its territory in Syria last year -- including its self-declared capital -- after coming under attack from separate offensives by Russian-backed regime troops and US-backed militia forces. Since then, Syrian President Bashar al-Assad's forces have quashed the last remaining rebel enclaves near the cities of Damascus and Homs. And in recent weeks, the regime retook a large swath of southern Syria from the opposition, pushing forward to seize a last pocket near Suwayda, home mostly to the country's minority Druze sect. But Wednesday's attack -- marked by a level of complexity that has not been seen from the group in some time -- shows ISIS still poses a threat through isolated attacks orchestrated from its remaining hideouts. ISIS controls a slice of territory in Daraa's Yarmouk river basin, near the Israeli-occupied Golan Heights -- one of the last areas in southern Syria not under government jurisdiction. The regime's extensive campaign to wrest the basin from ISIS affiliate Khalid ibn al-Walid Army, which has been punctuated by unrelenting airstrikes, has raised fears of further military escalation in the region. The Israeli military on Tuesday shot down a Syrian fighter jet conducting an operation against "terrorist groups" in the area after it entered the country's airspace. "The situation in southern Syria is more tense than ever, and in the mix is ISIS wanting to prove that it still prevails," Lina Khatib, head of the Middle East and North Africa program at London think tank Chatham House, told CNN. According to local officials, the fighters who carried out Wednesday's attack came from the desert area bordering Iraq and Jordan, where many fled in May during a government offensive in the southern suburbs of Damascus. Other ISIS fighters were recently relocated to the eastern desert after the regime expelled them from the Yarmouk region, Khatib said. Suwayda residents suspect that the regime's decision to place ISIS fighters in that particular location was made to punish them, Khatib added, a consequence of the Druze community refusing to participate in the regime's campaign in Eastern Ghouta. Gerges said that sowing these divisions is part of the group's goal: "ISIS has the capacity to exploit vacuums of authority and can pour gasoline on ethnic and regional tensions, which it has done in Suwayda." Photos circulating on social media Wednesday showed bodies purported to be ISIS fighters, strung up from street signs by angry residents. Some analysts believe the assault was an attempt to draw Russian-backed Syrian forces away from that battle in the Yarmouk basin, and ease pressure on ISIS militants still holding out there. But Khatib argues that it was simply meant to send a message: ISIS may be weakened, but it is not gone. "ISIS is likely to lose its last remaining holdout, but that does not mean that all of its fighters and weapons will necessarily disappear in that region. I expect that across Syria, wherever ISIS is able to find an opportunity to conduct attacks of the sort seen in Suwayda, it will continue to do so," Khatib said.